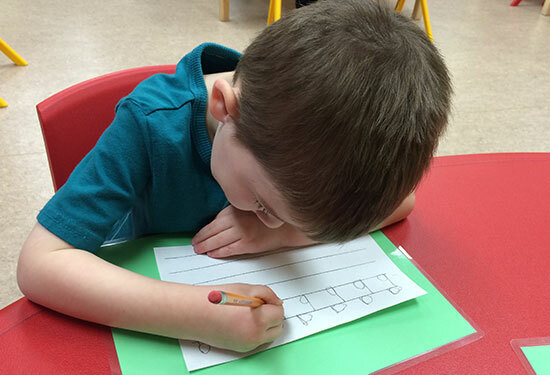 The Kinderhaus Montessori program helps children reach their full potential in all areas of life. 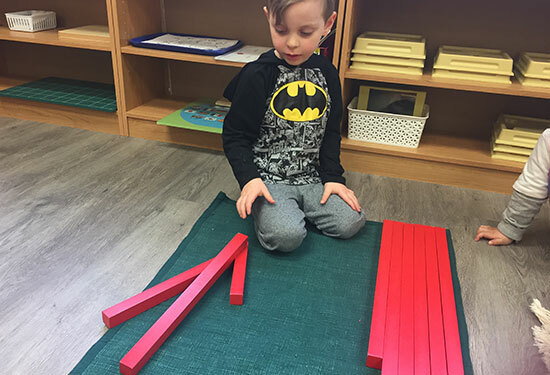 Our classroom is calm, orderly, and filled with self-correcting, didactic, scientifically-prepared Montessori materials that meet the child’s educational needs. 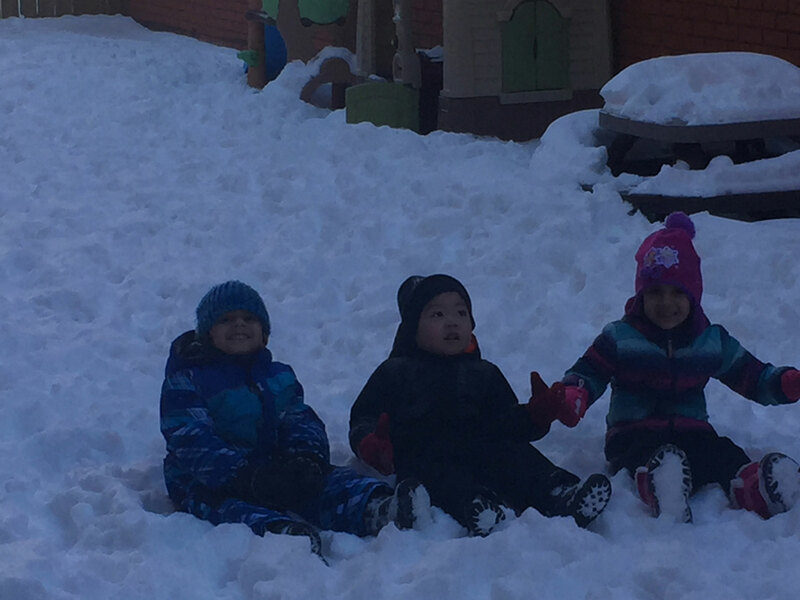 In our prepared environment children are free to grow, learn, and explore their world. However, this freedom is within the boundaries of the prepared environment. 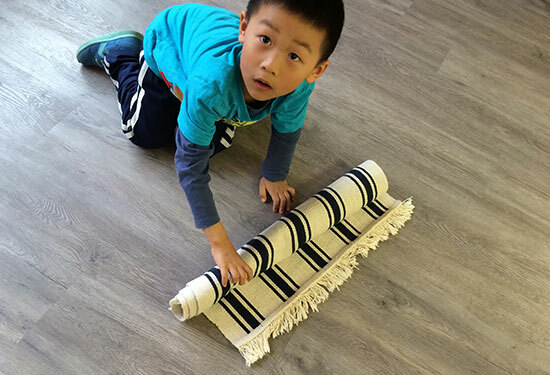 In our Montessori classroom the child is the “center of attention”, not the teacher. The teacher, a role model and a demonstrator, circulates through the classroom, observing and coaching individuals or groups. Children are clustered in groups representing a three year age span. The three year age span in the class provides a family-like grouping where learning can take place naturally. 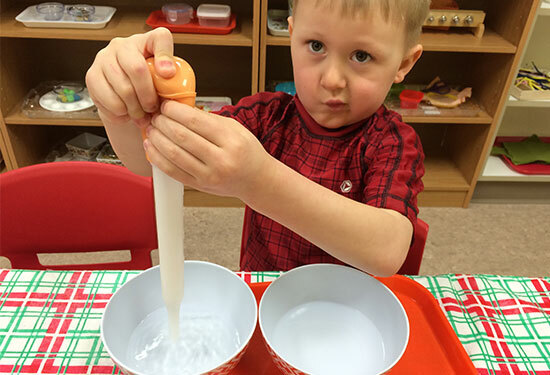 More experienced children share what they have learned, while reinforcing their own learning. Because of this peer-group learning, there is often more conversation and language experiences in our early education setting. 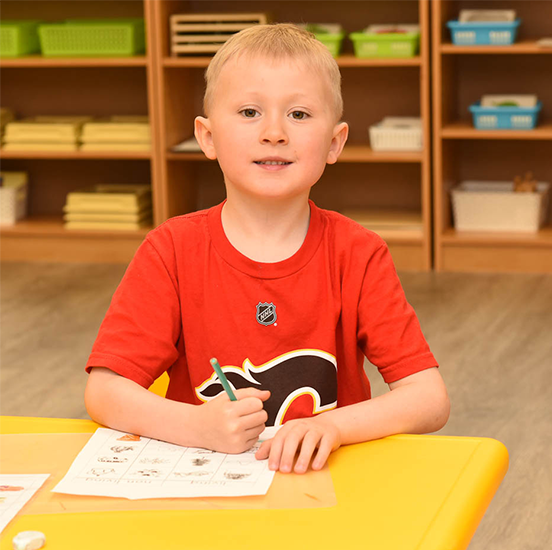 Kinderhaus Montessori children, ages 2.5 – 6 years, have the opportunity to develop a foundation of intellectual, social, and physical skills and experiences that will serve them throughout their lives. The classroom is arranged according to subject area.The areas in the classroom are practical life, sensorial, language, mathematics, geography, biology, history, art, science, and music. These are the everyday gestures, activities, and behaviours that the child sees performed by the adults. These exercises are exciting to children because they allow to imitate adults. 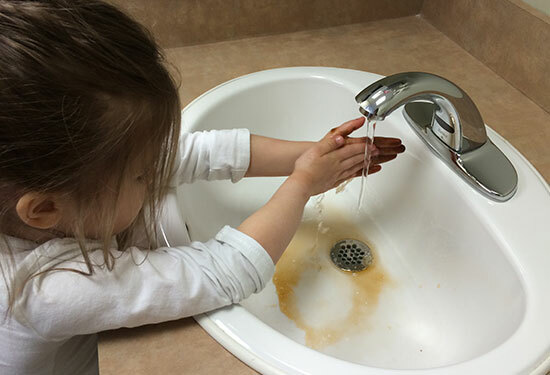 Imitation is one of the strongest urges during a child’s early years. These exercises help the children to perfect their coordination. Then the children gradually lengthen their span of concentration. They also learn to pay attention to details as they follow a regular sequence of actions. Through these exercises the children also learn to take care of themselves, take care of others, the environment, and to use grace and courtesy. Finally they learn good working habits. Some of the activities are pouring, sponging, folding, sweeping, polishing, washing, cutting, sewing, dressing frames, etc. 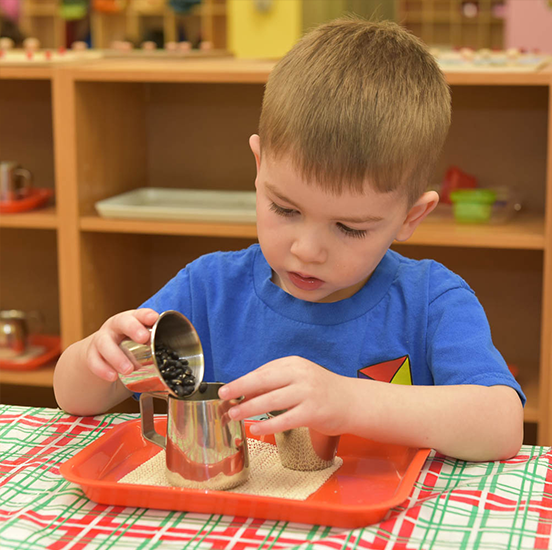 Using sight, sound, touch, taste, and smell, the sensorial materials enable preschool children to order, classify, and comprehend their world. Each of the sensorial materials isolates one defining quality such as colour, weight, shape, texture, size, sound, smell, etc. The equipment emphasizes this one particular quality while eliminating or minimizing other differences. Sense impressions are not enough by themselves. The mind needs education and training to be able to discriminate and appreciate. 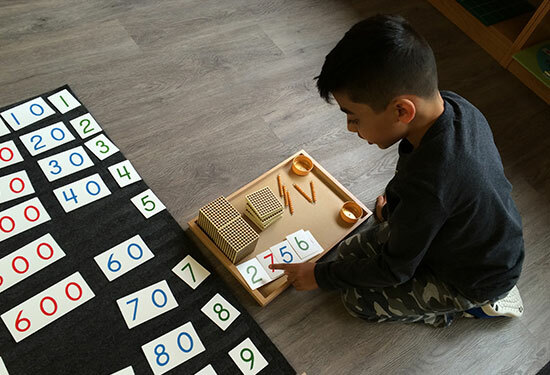 The Montessori sensorial materials help the child to distinguish, to categorize and to relate new information to what the child already knows. This process is the beginning of conscious knowledge. It is brought about by the intelligence working in a concentrated way on the impressions given by the senses. This lays the ground work for problem solving and encourages critical, independent thinking. The materials used in our classrooms include Cylinder Blocks, Pink Tower, Brown Stair, Red Rods, Colour Tablets, Touch Boards, Touch Tablets, Fabrics, Sound Cylinders, Smelling Bottles, Tasting Bottles, Geometric Cabinet, Constructive Triangles, etc. 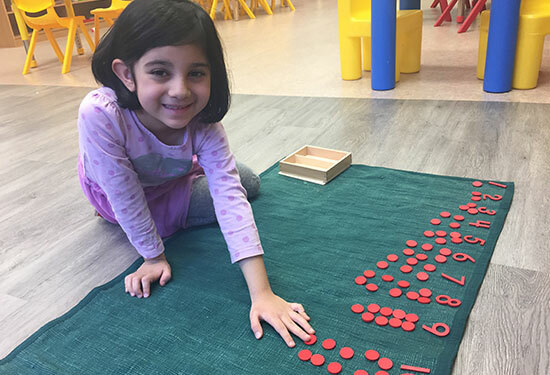 Montessori presents mathematical concepts to children in a concrete, hands-on manner. 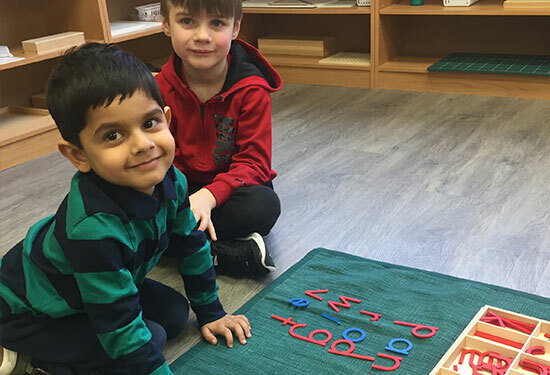 When children have access to mathematical equipment in their early years, they can easily and joyfully assimilate many facts and skills of arithmetic. Children are able to comprehend numerations, mathematical operations, decimal system, fractions, and so on. Careful designs of materials in mathematics and in the sensorial area lay the groundwork for future learning in algebra and geometry. 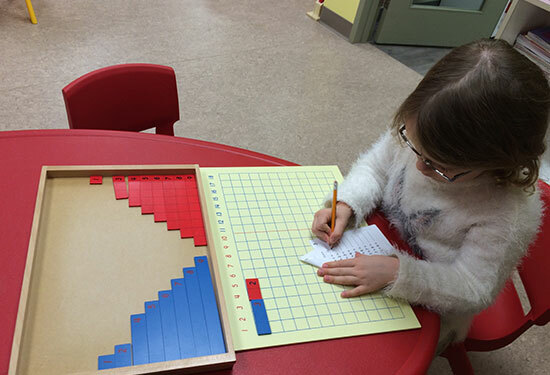 The math materials provide children with solid concepts of basic mathematical principles. This prepares the child for abstract reasoning and helps to develop problem-solving skills. Some of the materials we use are the number rods, sandpaper numbers, spindle boxes, Seguin boards, decimal system, and thousand chain, etc. Young children have a natural sensitivity for language development which follows closely on the years when they learn to speak their native language. The child at age 3, 4, and 5 has a unique fascination for words, both printed and spoken. This fascination often enables children to begin reading and writing before the age at which it is traditionally taught. 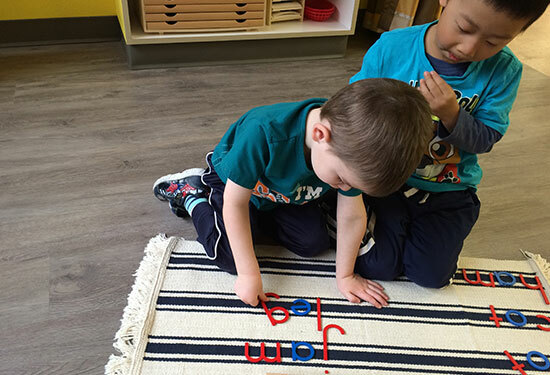 The materials for written language introduce the child to the alphabet and its sounds. In order to simplify the children’s first experience with letters, they are first introduced to the phonetic sounds of the alphabet rather than the names of the letters. 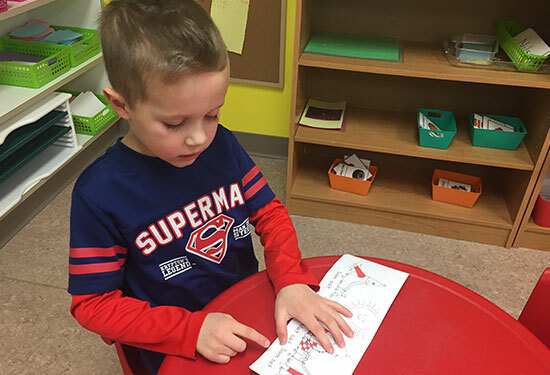 After a child has begun to successfully sound out phonetic words they may be introduced to word cards, sentences, and books. The cultural lessons (Biology, Geography, History, Science, Music, Art, and Nature Study) make the classroom come alive, allowing the children to feel connected to the global human family. Therefore the subjects are not taught individually but as connected parts of a whole. 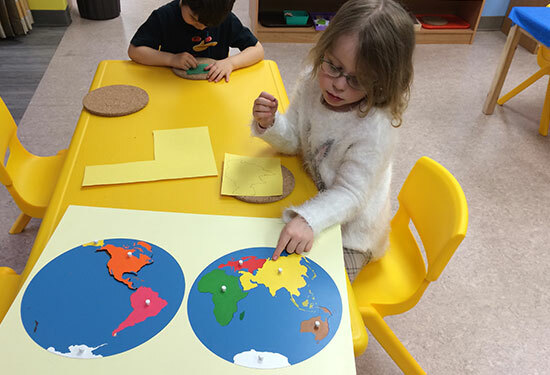 The children learn about other countries, their customs, food, music, climate, language, animals, etc. 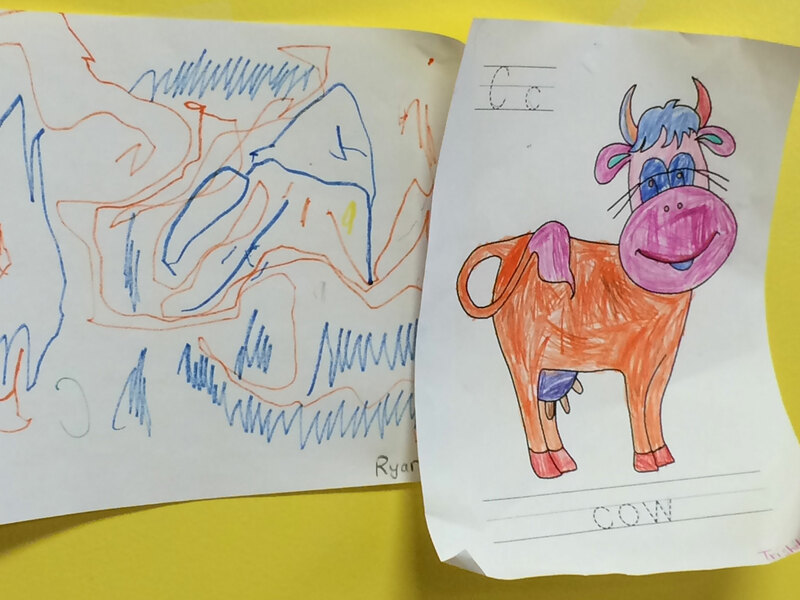 Children sing, colour, draw, paint, and dance. Therefore the environment awakens creativity and guides well-balanced children towards artistic development. Some materials in the classroom are a botany cabinet, basic animal classification materials, large puzzle maps, musical instruments, and so forth. 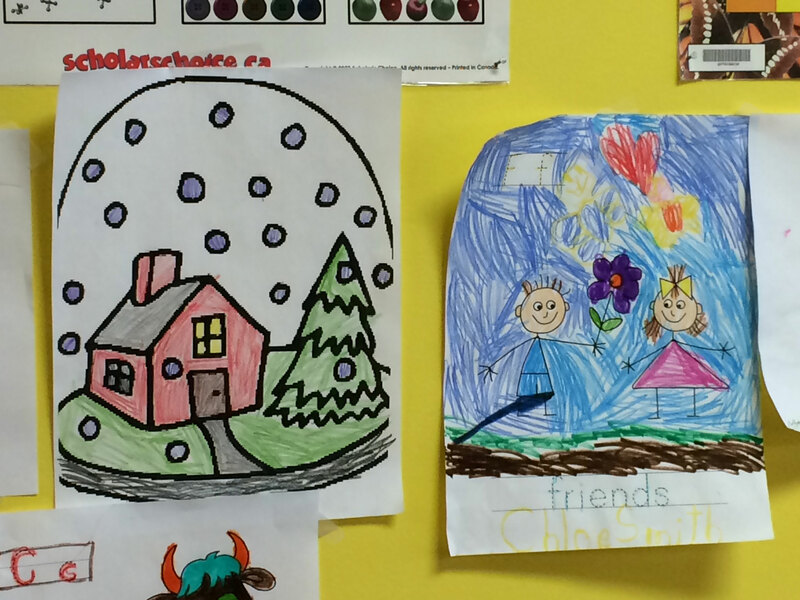 Kinderhaus Montessori believes that parents are a child’s first and most important teacher. Therefore they are encouraged to be actively involved in their child’s education. 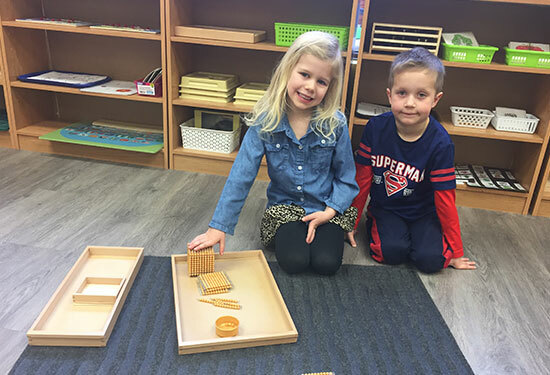 All three protagonists, the teachers, the children and the parents, all of whom may come from many varied cultural and educational backgrounds together form one community in the Kinderhaus Montessori School. It is a place where all children are seen as powerful and competent individuals, deserving of an exceptional and inspiring environment. 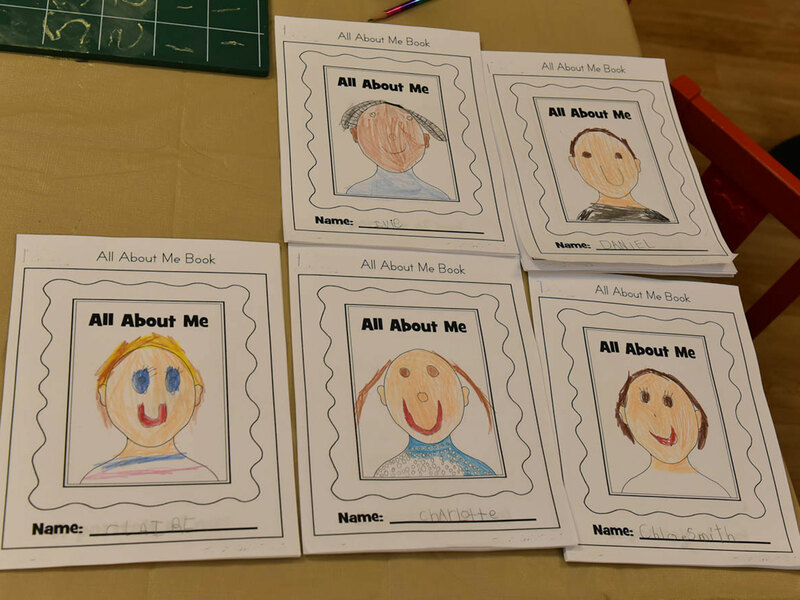 Kinderhaus Montessori Special Features & Activities!